Barraduff, Co.Kerry : Barraduff is on the N72 road from Killarney to Mallow. Registration for the first race takes place in Sweeney’s bar, Barraduff from 7pm. Please note that this race will start at 8pm sharp. Fossa, Co.Kerry : Fossa is just a few kms west of Killarney on the road to Killorglin. Just after you pass the turn off for Milltown/Dingle, look for the church on the left. Knocknagree, Co.Cork : Knocknagree is well signposted from the centre of Rathmore on the N72 Killarney to Mallow road. 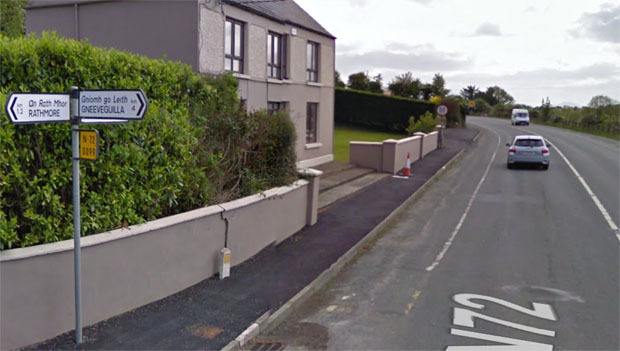 As the sign shows below, Knocknagree is 5kms from Rathmore. Ballydesmond, Co.Cork : The town of Ballydesmond is located on the R577 road between Boherbue and Castleisland. Gneeveguilla, Co.Kerry : About 1.2 kms west of Rathmore on the way to Killarney, you’ll find the turn off for Gneeveguilla which is 4kms from the N72.